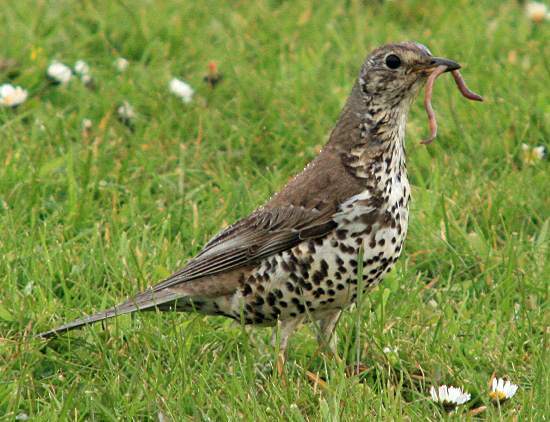 The mistle thrush, a resident bird in Britain, is quite a lot bigger than its less plentiful cousin the song thrush. It gets its name from the mistletoe, whose berries it avidly feeds upon. 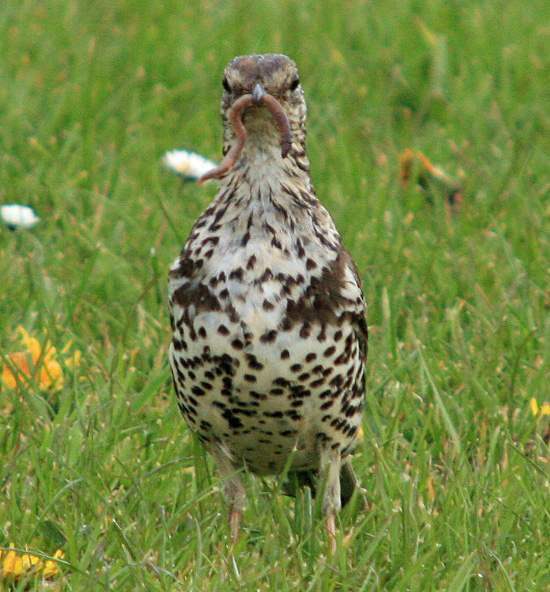 The pattern of dark brown spots is more or less random on a Mistle Thrush, compared with the somewhat more ordered lines of arrowhead-shaped spots on the breasts of most Song Thrushes. Mistle Thrushes usually build their nests in the fork of a tree, using grass, roots and mud and an inner lining of dry grass. Four or five pale eggs covered with grey-brown or a reddish-brown spots are a typical clutch. They nest in early spring. Snails, slugs, worms and insect grubs make up the staple diet of these hungry birds, but they also eat winged insects and are fond of berries (including mistletoe when and where they can find it). The Mistle Thrush sings a repetitive song, often from the top of a tree and apparently oblivious to bad weather, but it lacks the diverse repertoire and tonal quality of the Song Thrush.